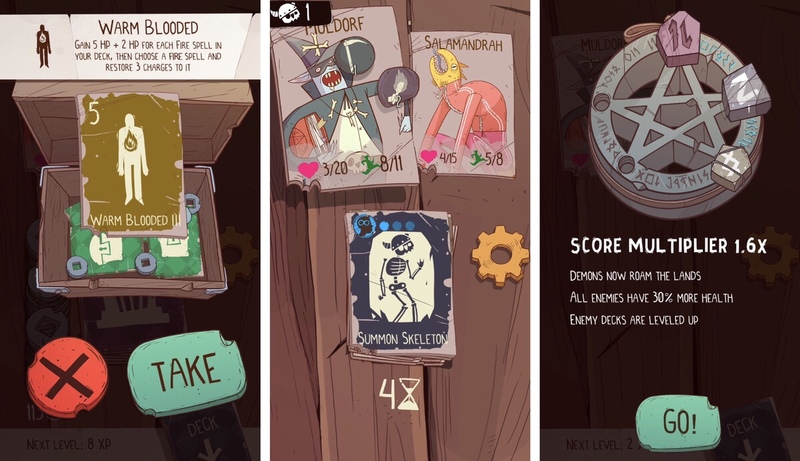 The Reigns-inspired card-based dungeon crawler, Meteorfall, has to be near the top of the list of the premium games with the most free content updates. I already loved the game when it originally released, but found it lost its appeal once I got close to the absolute highest score possible. Beating the game with each character was fun in itself, as they each had their own decks and provided different challenges. But past that, the only way to get a higher score than others was to spend as little gold as possible, thereby taking more risks. It wasn’t a bad way to offer replay-ability, but it had its limits. So I lost interest for a while. That is, until the developer released a new update with a new character named Muldorf and a whole new set of cards to go with him. He gets to control an undead army, and I had a ton of fun playing him. Still, once I got to a certain score with him, I lost interest again. Until now. I was fortunate enough to get early access to the upcoming Demon update, which adds exactly what’s been missing from this game — a sort of New Game+. The first time you beat the final boss named the Uberlich with a character, you get a bottle cap. That bottle cap allows you to play the Demon mode, which adds a whole bunch of new enemies to the mix. They put up a bigger fight, so it’s harder than the main game. But the benefit is that you get a 1.2x multiplier for all points you earn. And once you beat that, you unlock the next level, which gives a 1.4x multiplier. The catch that is that all enemies have 30% more health! I believe there are five levels, and once you beat the last one, you’re back to battling it out on the leaderboards by saving your gold. But that’s a hell of a lot of extra game before you get there. I’ve so far only beaten the first level with Bruno and the second level with Muldorf, but I want to try to beat the entire game with all characters. One thing I’ve been having to retrain myself to do is to use my coins on upgrades and purchases. I’ve been hoarding for so long, that I end up taking risks and dying instead of climbing to the next level. But I’m finally learning. Both the last update and this one also added a ton of new cards, as well as revamping some of the older ones. Shops are also more useful now, while temples are less so. Bruno also has a better deck, so winning with him isn’t so much about whittling his cards down to just Veteran Strike. There’s even some new two-part special events, like allowing some seemingly useless old man to join your party, or accepting a gift from a suspicious-looking spider. All in all, I’m having a ton of fun learning how to leverage the new cards and find new favorites. Like Warm Blooded, which gives you 5 HP, plus another 2 HP for each fire spell in your deck, and also lets you recharge three charges to a fire spell. Another favorite is the Trident that adds six damage to every attack that costs 3 stamina. You can watch my videos above to see more of the game in action, but I think it’s safe to say that if you lost interest in the game before, this update should pull you back in. There’s so much new stuff, and I’m impressed that the developer keeps adding more even though he doesn’t have to. If you haven’t played Meteorfall yet, now’s the perfect time to get started and catch up so you can jump right into the Demon world when it becomes available in the near future. And meanwhile, check out these super close calls above that I had recently. 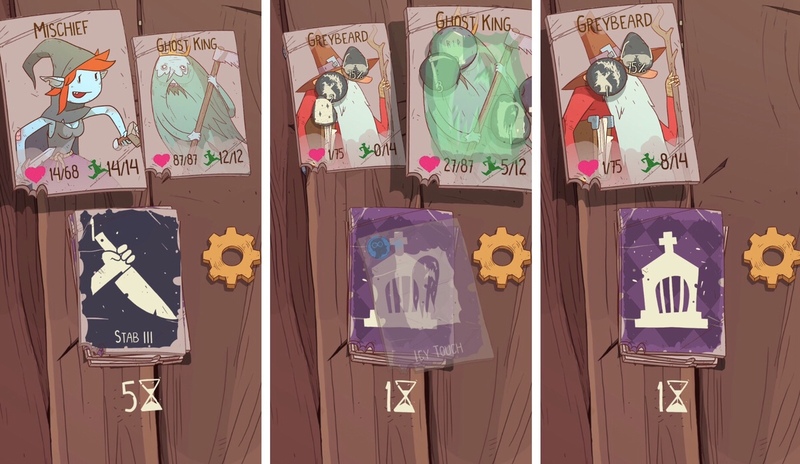 Greybeard defeated the third boss with only one health point left! And mischief started the third boss battle with only 14 points but I still managed to pull off a win! I really love those tense moments where you expect to lose and you manage to squeeze in a close win instead. Anyway, go grab the game and support developers who continue to support their games.